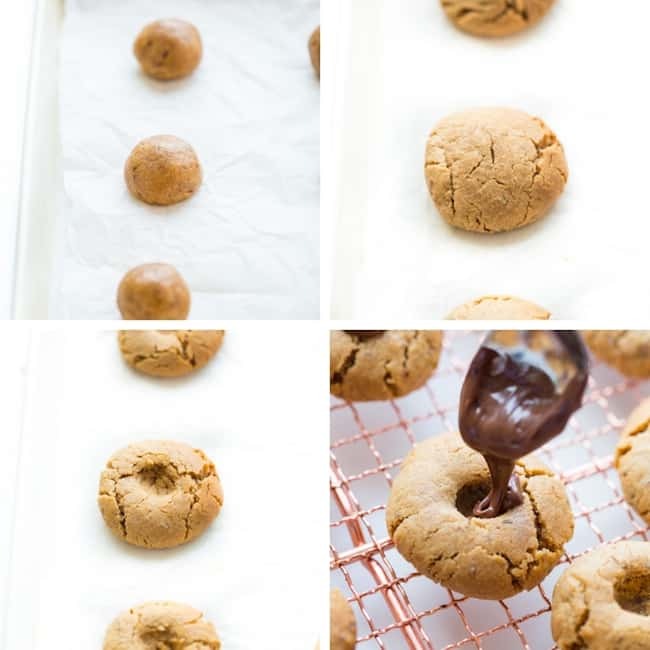 1 bowl + 7 ingredients = 16 soft and pillowy chocolate & hazelnut stuffed peanut butter cookies. I don’t know about you but as someone who’s not usually much of a numbers person that’s some quick math I can get behind. If only my upcoming tax refund (or lack there of) was this tasty. I’d be a lot more motivated to get through it then. I suppose I’ll just have to make sure there’s a cookie left for me at the end of it. My own chocolate, hazelnut and peanut butter flavoured light at the end of the tunnel, ya know? Right then. On to the cookies! It’s all mixed into one bowl until a soft dough forms. Roll about 1 1/2 tablespoons into little balls and bake for 10 minutes until golldened. Keep in Mind that you need to be extra careful when handling these cookies if you use a flax seed egg. The cookies have to cool completely before they’re easy enough to handle. Allow them time to cool on the baking sheet before you try to move them. When you’re ready to make room for the nutella be slow and careful as your press in the centres. The sides will crack slightly, but as long as you’re gentle they won’t break fully. Ideally you want to do this while they’re still a little warm so you can easily form the centres. Again though, once they’ve cooled completely you won’t notice any fragility. 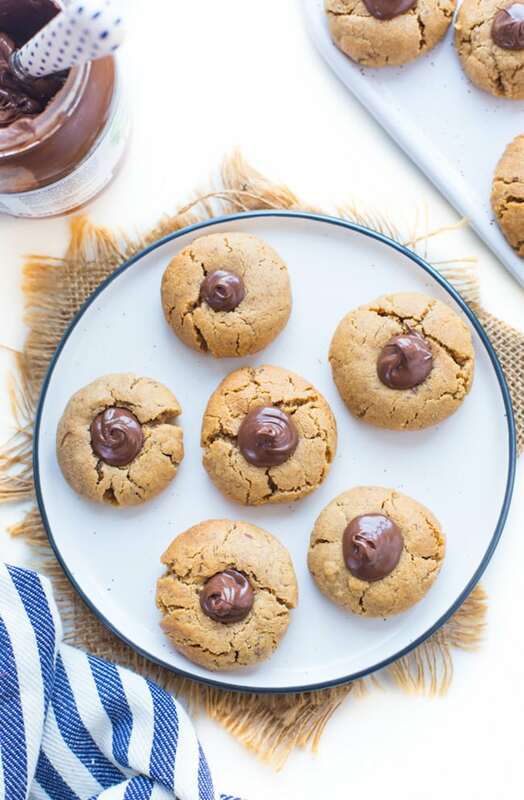 Don’t forget to #asaucykitchen on instagram if you try these Nutella Stuffed Peanut Butter Cookies! We love seeing what you make! You can also post your pictures to my facebook page! Preheat oven to 375°F/190°C. Lightly grease or line a couple large baking trays. Set aside. 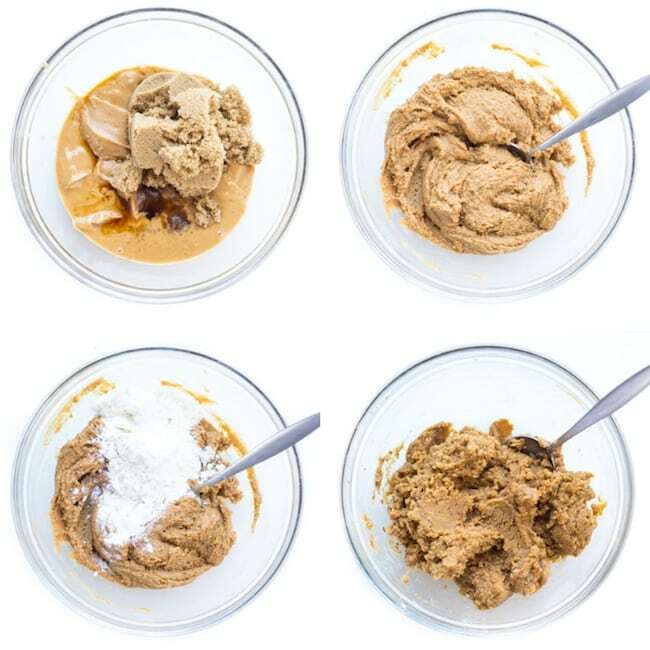 In a medium sized mixing bowl mix together the peanut butter, sugar vanilla and flax seed mixture. Once mixed stir in the flour and baking soda and mix well to combine. Scoop out the dough - about 1 1/2 tablespoons worth of dough and roll into balls. Place on the prepared baking sheets, about 2 inches apart. Place in the oven and bake for 9-11 minutes. The tops will be starting to golden. Remove from oven. While still warm, gently press a small dip into the centre of the cookies. Hold on to the sides of the cooking and be slow and gentle as you press the centres in. The edges will crack slightly as you do this - even more so if you use a flax egg. As long as you're careful the cookies will only crack slightly. Once completely cooled they'll be firm and easy to handle. Let the cookies cool completely on the baking sheet before attempting to move them. Warm up the chocolate hazelnut spread in the microwave for about 10-15 seconds. You want it warm so that it's to easy spread and handle and drizzle. 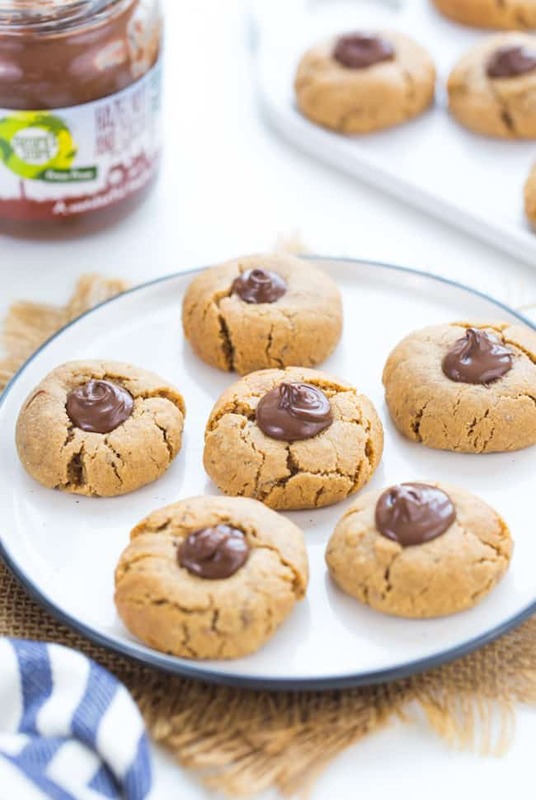 Use a small spoon to carefully add about 1/2 teaspoon of the nutella into the centres of the peanut butter cookies. Repeat until the remaining cookies have all been filled and enjoy! How to Make a Flax Egg: Make the flax egg: Mix 1 tablespoons ground flax (or ground chia seeds) with 2 tablespoons water. Stir and set aside about 10 minutes until the mixture gels up and then you're ready to use it. You can also use a regular chicken egg in place of the flax seed egg. If you do use a regular egg you don't need to worry about being as careful when handling the cookies. Make sure to use a vegan friendly chocolate hazelnut spread if you need this to be fully vegan/dairy free. These cookies look gorgeous! Can’t wait to try them! Thank you, Mira! 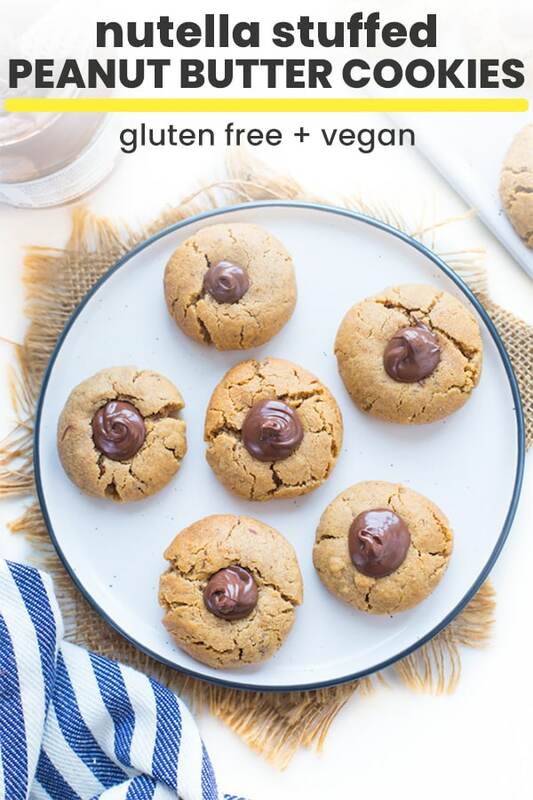 These last only about a day every time I make them because everyone eats them up so quickly which is certainly a good thing because then I know I’d be the one eating them all! These look delicious! I can't wait to try these!